National counsel to AvalonBay, a first-tier multifamily REIT, in connection with all aspects of large-scale development transactions in multiple jurisdictions across the country, including acquisitions, permitting, litigation and environmental. 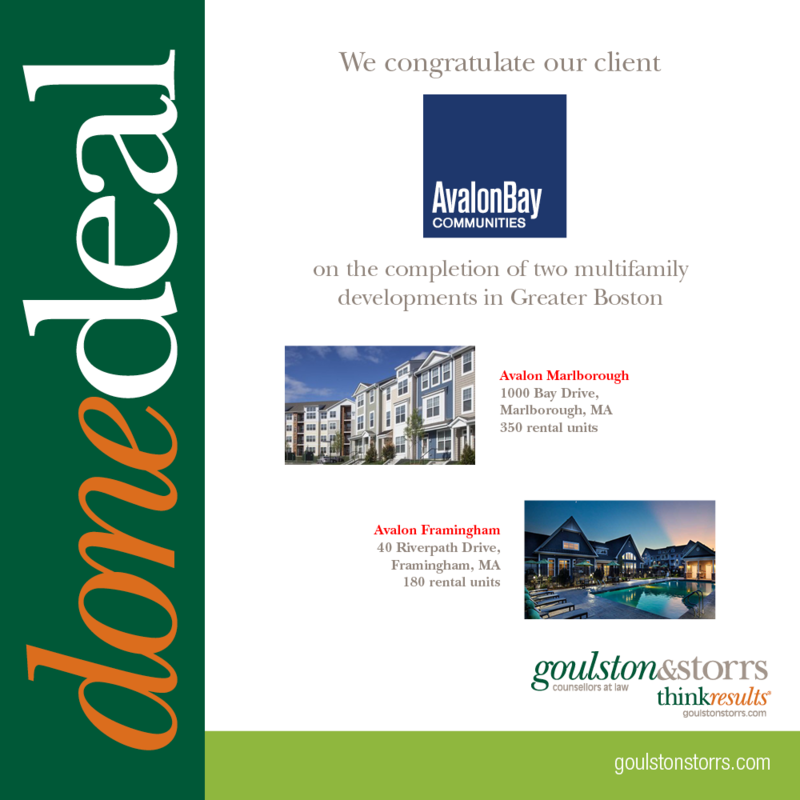 A few examples of our recent representation include development projects such as: Avalon North Station, AVA Theater District and the Exeter Apartments at Prudential Center (all in Boston, Massachusetts); the Public Market in Emeryville, California; numerous development projects in the Greater Washington, D.C. area, including in the District itself, Northern Virginia and Maryland; AVA North Point in Cambridge; and numerous suburban Massachusetts projects, including projects such as the Hingham Shipyard; Meadow Walk in Sudbury, Massachusetts; acquisition of the iconic former Hilltop Steakhouse (Saugus, MA); and acquisition and disposition of dozens of assets across the country, including Halstead Square and Market Common Clarendon in Virginia. We are also environmental counsel to AvalonBay in connection with development, acquisitions and dispositions (including environmental due diligence for acquisition), advice concerning regulatory compliance for assets slated for disposition, and in connection with development of Brownfields sites, and other complex environmental issues.